Of the five westerns that teamed James Stewart with director Anthony Mann, 1950’s Winchester ’73 is the best. Moreover, I rank it as one of the finest films ever made…period. Relying on a narrative that's entirely free-flowing, Winchester '73 never once becomes mired in the stale confines of a Hollywood formula. Lin McAdams (Stewart) has just won a sharpshooting contest in which the grand prize was an 1873 model Winchester rifle, considered by many the finest ever constructed. When Dutch Henry Brown (Stephen McNally), a man whom McAdams has been tracking for years, knocks him unconscious and steals the rifle, McAdams and his sidekick, High Spade (Millard Mitchell), set out to recover it. Will McAdams catch up with Dutch Henry Brown in time to retrieve his '73 Winchester, or will the shifty outlaw once again give him the slip? Before its through, Winchester ’73 will have branched off in many different directions. The moment Brown steals the rifle from McAdams, he and his men ride off into the desert, skipping town so quickly that they're forced to leave their sidearms behind. Along the way, they meet an Indian trader (John McIntire), who offers to buy the Winchester from Brown for $300. In need of new guns for his men, Brown has little choice but to sell his ill-gotten prize. The trader, in turn, sells the rifle to Chief Young Bull (Rock Hudson), who uses it to attack a Pennsylvania Cavalry Unit. Following the battle, the Winchester is retrieved by a soldier named Doan (a very young Tony Curtis), and immediately turned over to Steve Miller (Charles Drake), who helped the Cavalry unit fight off the attack. As you might expect, Miller won't be the last owner of this fine rifle. Under Anthony Mann's watchful eye, Winchester '73 constantly moves forward, from one situation to the next, never once adhering to any standard formula. Unlike many of his contemporaries, Mann realized the stories of the American West, at least the ones he was interested in exploring, were never told in three acts. Winchester ’73 is undoubtedly a classic of the genre, but I'd also recommend checking out the other Stewart/Mann western collaborations (Bend of the River, The Naked Spur, The Far Country and The Man from Laramie), all wonderful films in their own right. Each maintains a structural arc not unlike the one in Winchester ’73, where the only predictable element is their unpredictability. 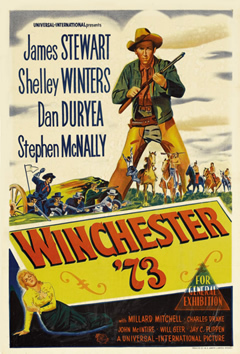 Working within a genre that boasted a rich and vibrant history, Anthony Mann still managed to stand apart from the rest, and Winchester ’73 is the pinnacle of his individuality.